Wyatt got accepted into a public preschool that is run by the YMCA. This is a good thing for us since the Christian one we were going to place him in cost $400 a month. By paying that we really had to cut corners in other areas. School starts in September so we are all excited. 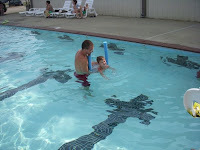 Wyatt started his swim class. He has two more weeks left. He is doing really great in learning some basics. They tell them to do things like pretend the pool is full of ice cream and their hands are scoops. I signed up for my classes at ODU for the fall semester. I have 80 credit hours right now and need 120 to graduate. I am taking 6 classes this semester and should graduate in the summer of 2010. I am ready to have school behind me. We also tried out a new church last week that Geoffrey and I both liked. Its a Nazarene church here in Virginia Beach. The people there were so friendly and welcoming to us. The Pastor invited us to lunch after the service and we had a very good time of socializing with them and two other couples. We are hoping to be adding on to our family soon. Wyatt was so cute the other night when Geoffrey was tucking him in. He told Geoffrey that he wanted to share his room with a little sister. He asked Geoffrey when we would have one. Geoffrey told him that we had to wait until God put one in my belly. So Wyatt prayed that night for God to put a baby in my belly. Wyatt said he wanted a little sister so he could teach her to brush her teeth, but the daddy would have to change his diapers. Its so sweet to watch Wyatt and Geoffrey become close. Wyatt told him tonight after dinner that he did a good job as a daddy. I thought that was so sweet. Like I said there is so much going on in our lives right now. Some of it I don't want to post until its all final. Please keep us in your prayers as we follow God's plan for our lives.